Hopefully many of you had the opportunity to stop by the Earth Day booths on April 22, participate in the discussion, and enter your guess for the prizes. Thanks to all who participated and congratulations to the winners. We only had space for one fact on the poster, “How many disposable coffee cups Canada uses each year”, but there are many more you may enjoy (read on!). Before we start, there’s a problem. While facts and figures may be interesting, what do they really mean? Making these numbers mean something is one of the biggest difficulties in making sense of our impact and driving change. I thought about using pictures, which the artist Chris Jordan has done an amazing job of and I encourage you to check out (Have you ever wanted to know what one million plastic cups looks like, which is the number used on airline flights in the US every 6 hours? http://www.chrisjordan.com). I considered relating them to other figures, did you know Canada disposes of more coffee cups per year than there are people in China, and that’s just our mere 30 million people out of nearly 7 Billion on the planet? But in the end I decided to use the statistics on coffee to relate back to basic principles that are true throughout our lives. After all, it’s not just about coffee. This first stat may surprise you. Coffee is the #2 traded commodity in the World. At this point you’re probably asking which is #1, the answer would be Crude Oil. Think about that for a minute, what we use crude oil for. Oil is everywhere, in our cars, in our power plants, in pipelines, refineries, tankers, and sand, and in this plastic keyboard I’m typing on right now, sitting in this plastic chair. There’s really only one use for coffee and 64% of Canadians say they drink it everyday, averaging 2.8 cups, with 88% saying they drink it at least once per week. Our individual acts, our morning routine, results in 2.25 Billion cups consumed each year worldwide. Coffee is not just a drink, a warm and pleasant routine, a break, or a comforting aroma. It is a resource, resources come from the Earth, and sometimes those resources come at the expense of other resources. If rainforests are removed to plant coffee, we lose natural filters, oxygen producers, habitat, biodiversity, and a complex ecosystem. For an example close to home, Canada’s boreal forest is estimated to have a living economic contribution of approximately $700 Billion dollars in services to the world each year (that’s 2.6 times the amount of spending on the Federal Budget). Brazil is one of the largest coffee producers in the world (nearly 40%). That means we are delivered coffee that is grown ~8000 miles from us (Toronto to Sao Paulo). The journey involves: trucks, cranes, ships, more trucks, packaging plants, people are every step (who also use transport to get to work, eat and likely have a coffee in the morning), more trucks to get to the building where we buy our coffee and the espresso machine used to make it. Someone had to make that espresso machine, deliver it, and power it. Someone had to produce that power and build the building that generates it. And so it goes on and on until we find everything is connected. How do we get our coffee? Well for many, it’s in a paper cup. In fact Canada produces 1.6 Billion Paper Coffee Cups per year, which takes 350,000 trees and 400 million gallons of water to produce. One study found that the city of Toronto produces 1,000,000 coffee cups per day alone. Not only do we consume the coffee, we consume all the materials and energy used to make the disposable cups. Further, these cups aren’t typically from recycled paper due to health regulations. The old adage, “you need money to make money” could be translated to, “to use energy you need energy”, or “to use resources you need resources”, or “to drink coffee you need a cup”. The average coffee cups is used for 10 to 15 minutes, after which it spends ~500 years in a landfill. Why? Paper cups are typically coated with a polyethylene or wax lining (to stop the liquid from seeping into the paper). Additionally, landfills are highly compressed, oxygen deprived environments, leading to the slow process of anaerobic (read: without oxygen) decomposition. This decomposition then produces methane gas, which is a greenhouse gas 16 times more potent than carbon dioxide. So what can we do? First, you can choose to buy fair trade coffee, rainforest alliance, etc. These certifications ensure coffee farming is more sustainable. Next, carry a reusable mug. It’s a simple act that lets people know you care about the world you live in and has a meaningful impact on your environment. For every 10 cups you save, that nearly 1m2 of vegetated habitat potential. Don’t worry you are not alone, there are more and more people carrying their mugs every day. Next, try making your coffee at home or sit down and enjoy a mug. Use the coffee grinds to fertilize your plants or garden. Don’t use the single serving coffee makers. 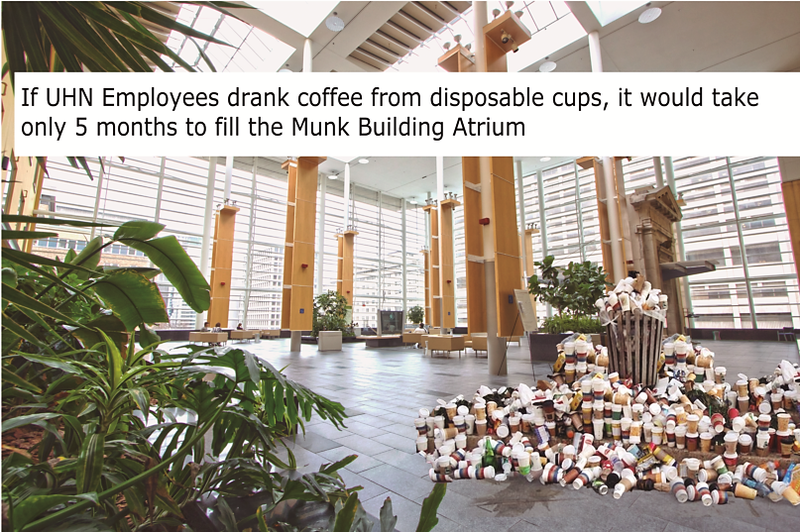 And if you do need to buy a coffee in a disposable cup, you can recycle them at UHN. This entry was posted in Beyond Talkin' Trash and tagged coffee, convenience, disposable, Earth Day, paper cups, principle, rainforest alliance, Toronto, waste. Bookmark the permalink. In which bin can we recycle disposable cups at UHN? I had always understood that these cannot be recycled. Glad you asked! Most of UHN, except TRI-Lyndhurst/Rumsay, has separated recycling. Please use the Metal/Glass/Plastic/Containers recycling (aka Cans & Bottles) for both the paper coffee cups and plastic lids at UHN. We ask that certain wet/mucky items like coffee cups, tetrapaks and milk cartons go in this bin instead so that we can keep the paper recycling clean, dry and more valuable for its next stage of life. If you have a styrofoam cup, please throw it in the garbage as it’s not recyclable at UHN (though it is in the City of Toronto). Great article. I’d like to see a mandatory surcharge on disposable coffee cups, much like the plastic bag one. It’s not about the money, but the environmental impact reminder you get every time someone asks. Thanks for the great comment and info Angela! I agree that a fee on disposable products seems to work better than a discount for reuse (just see plastic bags). I’ve read that this is in part because of the way people process loss differently than reward, but you bring up a good point in that it is a reminder to everyone who buys a coffee, not just those who already bring their cups. You also bring up a very interesting subject, that of biodegradability. You may already be aware of this, but it’s worth noting; there are different levels of ‘biodegradability’. For example, oxy or oxo-biodegradable plastics only break up into very tiny pieces; they do not convert into CO2 and organic material. These plastics only hide the problem and are able to enter our waterways and the food chain. This is not the case with the product you noted. The capsule product you found follows the European Standard EN 13432, it is truly biodegradable and compostable (see the link below for more info). Note that the standard is based on commercial/industrial composting facilities such as through the City of Toronto collection, so the capsule may not break down well in your backyard compost (worth a test perhaps). Composting the product would be key to achieving the benefit, as compared to a landfill. In a landfill, due to the limited oxygen, it would degrade very very slowly, if at all (check out the NY Times article about the excavation of landfills, 25 year old lettuce and 40 year old newspapers, linked below). This process also produces biogas (methane and CO2 mainly), which enters the atmosphere if left unharvested. It may seem obvious to put compostable products in the compost, but I once completed a waste audit for an organization that was purchasing compostable plates, cutlery, and cups, at a premium price only to throw them in with the rest of the garbage. There are reusable capsule options as well, but I don’t know enough about them to vouch for a particular type. It would be worth investigating. Thanks again for your comments. I’m glad you enjoyed the article; I know I was certainly surprised by some of the facts. What a great reply – thanks very much Chad! I actually didn’t really understand the various levels of biodegradability, so I really appreciate the explanation! I did know about the fact that things don’t biodegrade well in the landfill, a fact that needs to be spread far and wide, in my opinion! Keep up the fantastic work! That’s something I should have done (providing reference links) so I appologize for that. There’s a lot of content out there and when I wrote the article it took quite some time sorting through various websites (much like yourself I expect). I won’t reference each stat but I’ve provided the references that I used, listed by importance below. A couple things I prepared myself, like looking up the Canadian Governments budget and determing where most of our coffee comes from to calculate distances, etc.